In order to survive firefighter survival training, you must be young, strong, and crazy. What I lacked in young and strong I made up in crazy, and got through the gruelling three day course without dying of exhaustion or having a heart attack. While my burning passion and bubbling enthusiasm (mentioned in the previous post) were both undoubtedly alive and well in the depths of my soul, I opted to leave them buried, and relied on grim determination and stubborn tenacity to bolster my craziness and get me through. Not to say I didn't enjoy the course. There are just different levels of enjoyment. The young and strong enjoy conquering a brutal drill or beating the clock on a labyrinthine maze that would scare the Minotaur. I enjoyed stocking my arsenal with new new training ideas, and fitting more pieces into my overall training picture. The greatest enjoyment, however, came on Sunday when the lead instructor announced that the course was . . . over . . . and I was still . . . standing. Here's a blurry cell phone clip of a firefighter bailing out an second floor window. And another of a firefighter being pulled up from a hole in the floor on a hose line. 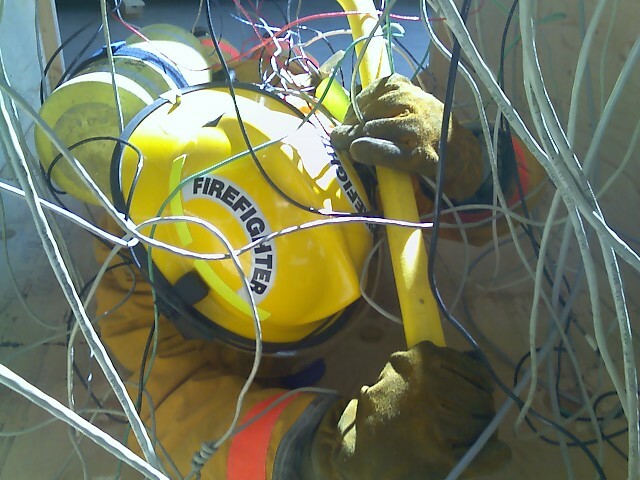 And here's a shot of a firefighter crawling through an entanglement maze. I would recommend the course to anyone that is, or hopes to be a firefighter, especially if they are young, strong, and crazy. Come to think of it, most firefighters are a little crazy. At least most of the ones I know. I'm actually thinking about making mild insanity a prerequisite for new recruits. Speaking of firefighter survival, a Swedish fire expert talked bluntly about the subject at a recent Fire Rescue International conference. Based on the hurricane of comments at the end of the FireRescue1 column on his presentation, he hit a few nerves. I'm unwilling to wade too deeply into this cat fight - even though August seems to be Cat Fight Month at Beebewitz Blog - except to say that I believe that improving our safety record doesn't mean we have to stop risking a lot to save a lot. We just need to stop risking a lot to save a little or nothing. Thus saith the Ant of Upsala.